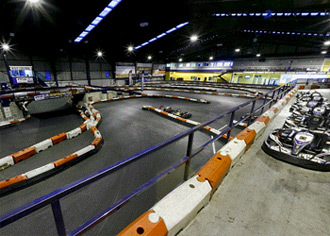 A very nice and professionally run indoor kart circuit in Leeds that uses the latest generation SODI GT5 karts, which has got to be worth a visit just for them! A full range of arrive-and-drive events/GPs/Team endurance races can be organised and the owners have gone the extra mile on presentation so expect a good event. Please note that crash helmet liners must be worn at this circuit and may be purchased from reception. From M1 then follow M621 signposted to Leeds City. Exit at Junction 4 signposted to Royal Armouries/Hunslet. Car Auctions. See highlighted section. From M62 exit at Junction 42 signposted M1 Leeds & The North. At M1 Junction 43 Follow M621 signposted to Leeds City Centre. Exit Junction 4 and see highlighted section. An adult only race event: Five minutes practice, 10-minutes qualifying to determine your grid position plus a 15-minute non-stop race.